Small - €47.99 Medium - €47.99 Only 1 left! Large - €47.99 Only 4 left! So your child is one with the Force, are they? Well, you know what comes next. That's right, training. Your child couldn't hope to be a Jedi without proper training. We're talking about using the force, practicing with lightsabers, and of course, learning mind games. Typically such training would involve being sent away to the Jedi temple on the planet of Coruscant... sorry? You don't want your child to be sent to a galaxy far far away? Oh dear, that does rather throw a wrench in things. Well, perhaps you could try a... how shall we say... home schooling? We're sure they will learn just as much practicing with lightsabers in the back yard as they would on Coruscant anyway. Although, if you decide to go the home-school route, and your little one is determined to join the Jedi Order and become a Padawan, you better look into getting them the proper attire; no silly bathrobe will do (okay, it might work, but definitely not the one covered in frogs!). 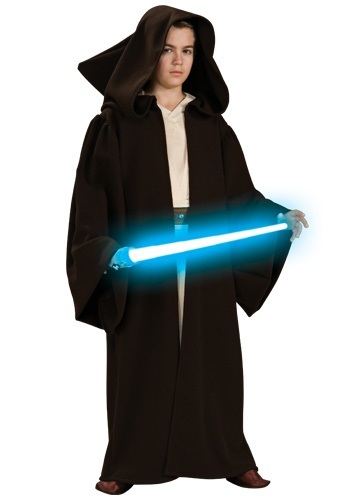 So if your little Jedi needs the right robes for the job, check out our Child Super Deluxe Jedi Robe. It's a full length brown robe with big hood and sleeves. Put them in this and they'll feel every bit the Jedi they're meant to be. Or, at least, they'll feel really really cool.